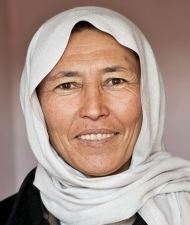 Fatema Akbari is a Hazara from Bamyan Province, where she was born 1966. Her husband was abducted by the Taliban in the 90th. He never returned home and is presumed dead. She is the owner of Gulistan Sadaqat Company, a furniture manufacturing business in Kabul. Founded in 2003, the business employs close to 100 Afghans, mostly women she has trained as carpenters. A widow herself, she prioritizes hiring women whose husbands have either been killed or disabled in the war, because she is passionate about helping women gain employment and secure their lives. Fatema, whose family fled to Iran when the Taliban came to power, learned carpentry at a young age and envisioned returning to Afghanistan to start her own carpentry business. She knew that starting a business was a risky venture, but she also knew that success would offer a means of employment to women in her province, and would prove that women could contribute equally to the economic stability of Afghanistan as a whole. After building her business, Fatema enrolled in the Goldman Sachs 10,000 Women program in 2009 at the American University of Afghanistan. There, she gained the management skills that would allow her to further grow the company. Vital Voices honors Fatema with the 10,000 Women Entrepreneurial Achievement Award for her work to empower other Afghan women — through the training and employment provided by her carpentry business, and through the literacy and skills training provided by her non-governmental organization (NGO) to women in Taliban-controlled areas. Since graduating, she has substantially increased her income, hired more workers and mapped out a strategy for her company over the next five years. With her increased profits, Fatema has expanded the efforts of her NGO, which has provided skills training and literacy classes for thousands of women in Taliban-controlled areas since 2004. The organization, Women Affairs Council, teaches women how to make jams and handicrafts, how to tailor and weave and also educates women and men about human rights. Fatema has trained 5,610 men and women across Afghanistan. Her leadership — as a businesswoman, an educator and the elected representative of her district’s business council — has earned her respect from many in her community, and she is dedicated to empowering the next generation of young women leaders. One of these young women is her daughter, Shahla Akbari (born 1990). After graduating from the 10,000 Women program, Fatema was also able to use her increased income to fund the launch of Shahla’s own footwear company. Shahla has grown that business in a very short time. She now employs 20 people, runs two workshops, and — thanks to the encouragement of her mother — she is now a graduate of 10,000 Women as well. Fatema says, "I support my daughter and I guide her in her business so she can be successful and build our home country.” With her courage, dedication and entrepreneurial spirit, Fatema is helping Shahla, and countless women throughout her country, provide for themselves and their families because she believes that giving opportunity to the women of Afghanistan is the surest way to build a safe and prosperous Afghanistan.